Spread the grated cheese onto a plate and freeze for at least 1 hour or up to overnight. Arrange 2 racks to divide the oven into thirds and heat to 300°F. Line 2 rimmed baking sheets with parchment paper; set aside. Transfer the frozen cheese to a food processor fitted with the blade attachment. Pulse until it forms fine crumbs, 12 to 15 pulses; set aside. Place the egg whites and cream of tartar in a stand mixer fitted with the whisk attachment. (Alternatively, use an electric hand mixer and medium bowl.) Beat on medium-high speed until stiff peaks form, about 5 minutes. Add the cheese crumbs and almond flour and carefully fold them in by hand with a rubber spatula, keeping as much air in the whites as possible. Transfer to a quart-sized zip-top bag. Cut off a bottom corner of the bag with scissors to make a 1/4-inch-wide opening. Pipe the batter into 1 1/2-inch lengths onto the prepared baking sheets, keeping them as close together without touching. 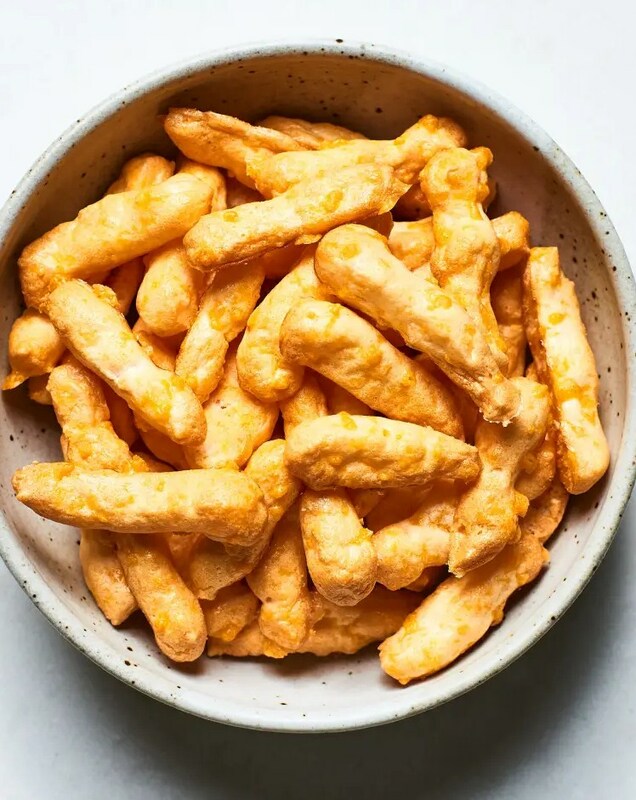 Vary the shape and length for the most cheeto-like results. Bake until golden-brown and mostly dry, 25 to 30 minutes. Turn off the heat and continue to dry in the warm oven for 30 minutes more. Good luck not eating them all in one sitting.